You knew it had to be done at some point. We all know the rage that is the Apple iPad and we for sure know the excitement behind the late-model Ford Mustang. Well, here we are, pumped up about what one of our members has completed. 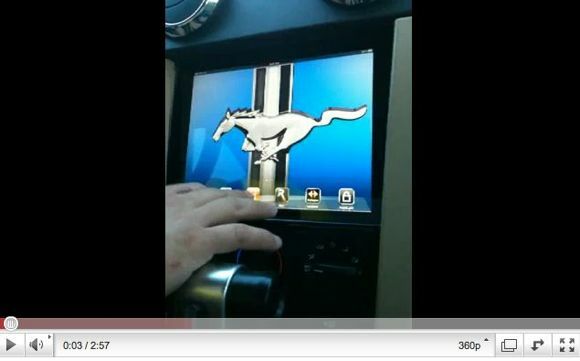 He’s rammed a new Apple iPad into his S197 Mustang and he’s got the video to prove it in action. Keep reading to catch the video and see what koach has in store for you. Features: GPS w/live traffic, 3G Internet, Streaming Radio, Onboard Diagnostics, iTunes, App Store, High Resolution Screen, Video, YouTube, Email, Calendar, Contacts, and Much More. Why I did it: The first thing that came to my mind when I saw the iPad was this is the car system I have been waiting for. The other DVD/GPS systems were ugly, glitchy, slow, and had very low resolution screens. Also, I have always dreamed of having internet in my car for traffic updates, restaurant reviews, and everything else. The iPad also gave me a chance to go disk-less in my car. We have been disk-less at home for a while now so it was only natural to get rid of that dated CD player and FM radio. The last reason was cost. I looked into installing a carputer or a high end dvd/GPS unit but to get all the features I wanted it was going to cost $$$$. With the iPad I could get wifi, GPS, iTunes, Video, Apps, 3G internet, etc… all for $699 or so. What was needed: At first I was just running the iPad off of an old Sony deck that was stuffed behind the unit. This was never meant to be permanent but did workout ok. But in order for me to be happy with the project it couldn’t be half done and I wanted a standalone system. I decided to run the iPad directly from a 4 channel amplifier. I used a headphone splitter and then two headphone to RCA adapters to run to the amp. Then wired the four cabin speakers to the amp. This worked pretty good but it had a couple of draw backs, the biggest being volume control. Because all of the buttons are inaccessible I had to use the iPod app volume slider to control volume for the entire unit. So if I was listening to Pandora and I wanted to change the volume I would have to close the app open the iPod app change the volume and than return to Pandora. This was a pain but manageable. I decided I needed volume control and an equalizer so I got a 3Sixty.2 from Rockford Fosgate. This gave me everything I wanted and more. I also wanted to be able to run diagnostics on the iPad monitoring my boost, engine temp, WHP, etc… So I bought a Plex Kiwi Wifi and the Rev2 App. This is really cool. Is it Removable: Kind-of…. If I really need to I can remove it in under 3 min. (I did time it). But it was meant to be an in-dash only system. I had only seen two other iPad installs in a car both were removable and both looked cheap. I didn’t want to plug and unplug, I just want to get in and drive! Pros: Awesomeness!!! The iPad was made for the car, GPS works way better than expected and real time traffic and construction updates are amazing! Streaming Radio is also amazing I have yet to loose signal with AT&T Pandora rocks. The screen looks great even in direct sunlight, I do have tinted windows so I think that helps a lot. Cons: Over heating! On most day’s it is not an issue, however on exceptionally hot days if I forget to put up my sun visor the iPad does over heat. After about 5min with AC on it is fine. Again this can be avoided by just remembering to put up a sun visor witch is good for your interior anyway. I am worried about theft but I park in a garage most of the time and I have a top of the line security system installed. Like I said before it’s no different than having a $700 system in your car. Must have Apps: If you install an iPad like this you must Jailbreak. Rev2, Pandora, State Farm Insurance App, Full Force (a jail break app that allows full screen iphone apps on ipad), 3G unrestrictor. Awesome, I thought exactly the same when the iPad came out. Very cool solution! The only thing that would bug me is that you can't simply pull it out. There will be a time when you want to sync your music with iTunes 🙂 Maybe you could integrate a slot from the passenger side? I'd really like to see photos of the install process and how you attached it in this position. I looked up the recommended apps on iTunes and could not find them. If the car tips over will the screen adjust?! Way cool. There's now a great free traffic app for the iPhone that's now iPad compatible that would look great in that mustang — INRIX Traffic! Check it out. I set it up so it syncs over wifi. It was a pain but it now syncs perfectly over my wireless network. That has to be the most dangerous thing I can think of!!!! Koach, thanks for stopping by the mustang show swap meet last weekend and showing your system to us. Awesome system. Got your e-mail will be considering it soon. I'll keep in contact. I’m so inspired by your video. I had the idea about the iPad working in the car because I run my iPhone the same way. I bought an auxiliary input component a few years ago so I could run the iPhone. I’m pleased because not only can I listen to music, I was able to use the phone over the stereo as well. Then came navigation for iPhones and I was set. I use navigon from my iPhone. Recently I rigged the iPad case with two clips and a small strap. I clip one end to the air vents at the very front of the dash (defogger). then I attached the other end to the cover of the ipad jacket. I bought a 1.5 meter long audio cable that plugs into the Ipad and then into the auxiliary input jack. it’s ok because I don’t need to please anyone however I really want to devise it so that it looks like yours. can you elaborate how you connected your plex kiwi wifi? also what did you do with the functions underneath: info, menu, reset, TSC and Hazards? did you relocate them. I’m considering using much smaller buttons and placing them on the side running up/down. I really like what you did. excellent job and it looks awesome. i’ll post a video on what I did, it’s a bit primitive but it works. I plan to build a cradle into the dash which will make removal just a few seconds so the ipad can be used after driving. Great… where’s the screen that shows all the engine parameters? my brother is wanting to do the samething in his hummer. but he cant bypass the volume control since he uses RCA cables. is there anything he can do?